While video game robots are all well and good, it takes a special sort of robot to carry a pinball game. Sure, he may bear a striking resemblance to Cobra Commander, but we love Pin*Bot. 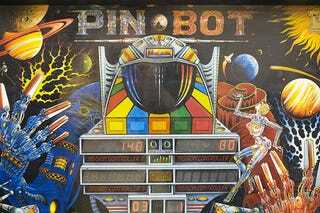 Pin*Bot originates from the 1986 Williams pinball table of the same name. As you attempt to advance your silver ball from Pluto to the Sun, Pin-Bot is always watching you, even before you fire a couple of pinballs into his empty eye sockets, causing him to intone "Now I see you." He is an iconic figure in pinball history, spawning two sequels - The Machine: Bride of Pin*Bot and Jack*Bot - along with a video game version for the Nintendo Entertainment System. Pin*Bot is a genuine gaming robot pioneer, with a hot wife to boot.